This session will help participants reflect on the role of culture in the LOTE classroom at all Checkpoints. Using the National Standards for Foreign Language as a framework, practitioners will learn ways to help students uncover cultural perspectives by examining cultural products and practices. Using this approach, teachers can make every day a culture day! The presentation is in English with examples in Spanish. The content is applicable to all language classrooms. This webinar offers an opportunity to explore ways to build strong teacher$parent partnerships as well as strategies to ensure a direct connection between the foreign language learning in school and back home. Participants will value the importance that parents’ involvement can have in foreign language learning and instruction. Discussions and activities will help develop and make teacher$parent partnerships as effective and positive of an experience as possible. Participants will be presented different approaches to involve parents in their classroom routine using simplistic and powerful techniques. 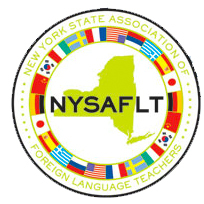 Eventually, participants will get familiar with the parents as language partners section of the NYSAFLT website in order to both direct and help parents or guardians of students in the learning of a foreign language. In this webinar, participants will learn of the many outstanding capabilities of interactive whiteboards. We’ll specifically be using the SMARTBoard Notebook software. Walk away from this session with several ideas about how to integrate this well established technology into your language classroom. Your students will be more engaged and motivated yielding in their learning more efficiently and being able to listen, speak, read, and write in the target language more accurately. Examples will be in French and Spanish, but can be adapted to any language. This workshop is for world language or ESL teachers who have students at any level, PK-16. Are you struggling to use the target language 90 of your instructional time? Why? Do you feel you don’t have the time? Are your students confused? Do you wish you were better at speaking the language? The seven language promoting strategies presented in this webinar can improve your confidence and your students’ willingness to experiment and interact with any target language. This session will explore web based tools such as blogs, wikis, podcasts, social networking and bookmarking sites. An overview of different tools will be provided, as well as a rationale for their use in teaching languages, with the goal of demystifying these tools and demonstrating their use in teaching and assessing English Language Learners. The goal of this webinar is to acquaint language teachers with the unique and valuable resources available to them on the web and to provide concrete lesson ideas that will help teachers incorporate web$tools into their world language classes. Note: Video for this webinar is not available, but the presenter has provided the PowerPoint presentation used. In this workshop we will begin by reviewing the NYS Standards for LOTE as well as the topics, skills and functions outlined in the NYS Syllabus: Modern Languages for Communication. We will then analyze the format of the former SLP and Regents exams. We will then examine in detail how to find appropriate authentic materials and develop solid, well written, valid multiple choice questions for assessing listening and reading. Several examples of teacher-written items will be shared. Please note that there was a recording issue with this webinar. It was recorded in GotoMeeting format. Audio is available, video for some may not be. This webinar will provide participants with specific assessment ideas that integrate technology and speaking, listening, reading and writing. Participants will also be provided with sample rubrics. This is appropriate for Checkpoints B & C.
Thematic instruction is a way of organizing lessons that teach vocabulary and language structures while exploring the themes and/or content of another subject area or discipline, such as math, science, social studies, art, health, etc. By hiding or embedding content into fun and interesting themes, teachers can provide a context so that the instructional focus shifts from the LANGUAGE to the USE OF LANGUAGE. Webinar participants will go through the steps of building a thematic unit and then see some examples.